The water is completely safe to drink straight out of the tap. Bring a water bottle and you will be set. Like many cities, Hong Kong has a lot of trash and not a ton of land, so you can do your part to help by using a refillable water bottle. When you are out and about there are many places to top off your water bottle. The app “Water for Free” and the website Water for Free help you find some of these locations. We really like this 2L collapsible water bottle by Platypus for about $12: Platypus DuoLock. Many of the others are good, but the clip on this one was perfect for clipping onto bags, the back of seats, etc, and the removable top made it easier to clean than most. 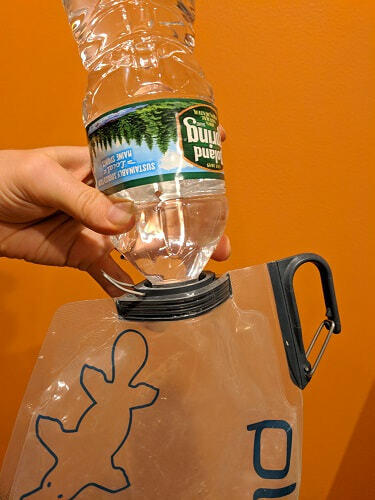 The removable cap also made it much easier to fill, and happened to be exactly the size of a standard water bottle, so you could put it over the mouth and fill the Platypus without spilling a drop (see image below). Wifi - Most hotels, the MTR, and some restaurants have free wifi and it is generally very fast. Hong Kong internet is not behind the “Great Firewall of China” so you can browse the web more or less as you do at home, but it is best to assume that your web traffic can still be watched. Phones - We use Google’s Project Fi for phone service, which allows us service as soon as we get off the plane in most countries, with a data rate of $10 per GB. It worked like a charm here and since we were only in Hong Kong for a few days we never got a local SIM. Local SIMs are reasonable, readily available, and have a wide variety of options. Tally Pack has a pretty good article on some of the options. Even if you don’t have phone service you should always be able to access GPS. I download the maps ahead of time using **Google Maps offline and/or Here Maps (see instructions for how in my Tips/Planning - GPS & Maps Post). Both will allow you to navigate with no service as long as you have the maps downloaded. You can search for an address or GPS points, but general search queries like restaurants generally won’t work. I like to make a list of the GPS coordinates for each hotel I am staying at and other places of interest ahead of time so I can just enter the coordinates. https://www.gps-coordinates.net/ is a good site to use for this. ** Hong Kong Offline Map Trick - I had a little trouble downloading the maps for Hong Kong but eventually found a trick. As of 2018 Google Maps covered mainland China but did not allow downloads. Therefore, if the part of the map you are trying to download shows any part of mainland China it will prevent you from downloading it. If you shrink or move the box so only Hong Kong is shown you can download without issue. I had to do this in a couple steps to get all of the islands. We were surprised to learn that Hong Kong is still a very cash centered society. You can use a credit card for some things, but most places are cash only or accept cash and the Octopus Card (more on that under Transportation). We generally carry some backup cash in USD and have some of it split into small bills at the bank before we leave, but we usually keep this as a reserve and get most of our money from ATMs. Our bank allows 10 free withdraws per month and uses the current exchange rate (unless the bank does the conversion first) so the only fee we pay is whatever the ATM charges. Some places this is nothing, but in Hong Kong there is small fee of about $0.25-$2 per transaction. We withdrew twice from HSBC and the fees were $0.51 and $1.15. Credit Cards - Mostly useless. The airport, hotel reservations, and some fast food chains like McDonald’s were about the only place you can use credit cards. When we showed up at our hotel they required a cash deposit instead of the usual credit card hold. We gave them USD, got a signed receipt, and were given the same USD back when we left, which saved us from having to take a bunch of money out and have to get it converted back. Exchange Rate - The exchange rate fluctuates, but when we were there was about 8 HKD to 1 US dollar. If you have a hard time doing the math in your head I recommend getting an app and/or making up a little card to keep in your pocket or wallet with an exchange chart to help. I laminated mine with a couple pieces of packing tape. I like to have $1-10, then I go up in $5 increments. Most prices in Hing Kong were roughly about the same as what we would expect to pay in the US (see Hong Kong Food for a better idea). There are many options for transit, including trains, taxis, buses, ferries, ding ding, and Uber (works as long as you have data), and we used most of them. I like to use Google Maps and Rome2Rio for an idea of what options are available for getting around and what the approximate cost will be. See the section below for Airport specific transportation. Octopus Card - This is your key to hassle free public transit. It is a card that you can pre-load with however much you want and simply tap to pay the exact amount. Many fares are discounted for card holders and for some forms of transit like the bus it saves you from needing exact change. You can buy your card right at the airport or at any MTR station, but the airport is the only location where you can use a credit card. Every person must have their own card. Each card has a deposit that is refunded in cash when you turn the card in, as well as any remaining balance. They will deduct a small “rental” fee (only about $1 USD). You can refill the card with cash at the machines in any MTR station or authorized stores like 7-Eleven. There are several package deals, but most are not worth it and you are generally better off just paying as you go. The octopus card can be used on all forms of public transit and in some stores and restaurants. If you see a picture of the card that usually means they accept it but it never hurts to check. Around the city you may see people tapping their cards on these fare saver kiosks. Go ahead and tap yours if you see one. 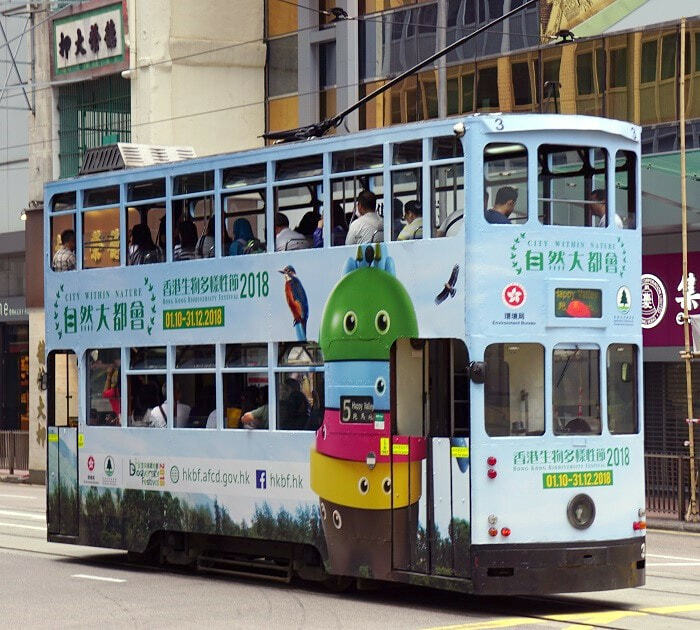 It is a program that give you a 2 HKD discount on your next MTR ride and works once per day. You can find details on the program here. Train - The Hong Kong MTR system is fast and efficient. You can swipe your Octopus card or buy a single ride pass. The trains are very clean and there are fines for eating or drinking. Most stations have maps and are very well marked. Many have bathrooms inside the gates, so if you need one make sure to use it before you swipe to get out. The stations in the New Territories are a little more basic and the trains tend to be older, with occasional delays, but still work well. Bus - There are small local buses and big city buses. Both run fairly regular schedules and most are air conditioned. Most buses change a flat rate regardless of how far you go and they always require the exact fare if you pay cash. You can pay extra, but there is no change. For the local buses you usually raise a hand to stop it, but everyone is required to have a seat, so if you see a bus pass you it may be full. For the city buses most stops have large signs at the stops for people to line up at. Some even have marked queuing areas for each separate bus line. We really enjoyed riding in the front on the upper level of the double decker buses. You get to see so much! Ferry - There are a few ferries but the Star Ferry is the most popular. This is a great way see Victoria Harbor and one of the least expensive ways to cross it. As of 2018 fares ranges from 2.50 - 4.00 HKD (less than $1USD). The ride isn’t very long and you have your choice of benches or standing and walking around the deck for the perfect view. These boats are old and slow, but solid. A plus to the slow speed is that it supposedly makes them more marine life friendly, since dolphins and other animals often get cut by the props of the faster boats. The Star Ferry Terminal has a good view of the waterfront and can be a good place to watch the nightly light show. There are other ferries to get to some of the smaller islands. You can find more on them here. Ding Ding (street car, tram, or trolly) - These are inexpensive and can be a fun way to see Central. At night and peak hours they can get very crowded and backed up, but other times of day they are mostly empty. These are about economy and the experience not speed. Tickets were a flat rate of 2.60 HKD (less than .50 USD) for adults as of 2018. For everything you want to know and then some about the Ding Ding check out Next Stop Hong Kong. The airport is clean and modern. They have trains to move people between terminals and it is pretty easy to find your way around. There are several food options and while they weren’t cheap, they were not bad by airport standards. There are also several places to fill water bottles. Customs was quick and efficient. Taxi/Uber - You can do it and it may make sense depending on where you are headed or if you come in late with a group, but it is generally a waste of money and only saves a little time. Airport Express Train - The train is easy to use, is available later than the buses, and has a free shuttle to get you closer to your final destination (depending upon the time). It is a bit more expensive than the bus, but also a bit faster. Discounted rates are available for group tickets and tickets can be purchased with a credit card at the airport. We used the train to get from the airport to Kowloon when we came in and it was a pleasant experience. We got glimpses of outside every now and then, but couldn’t see a ton. We purposely booked a hotel close to the Airport Express Terminal so we could crash as soon as we got in and that worked fairly well, except for the maze at the exit. Like many trains, this one lets you off in a mall that has an easily assessable taxi stand, but it is hard to find the way to the street in order to walk or get an Uber. These malls seem to be designed to keep you and can be very difficult to navigate, even if you do find a map. Airport Bus - This is the least expensive option and I was very impressed with this service. There are a couple airport bus lines that service different areas of the city. We took the A21 from Kowloon on a weekday around noon and it was excellent. The bus had a luggage rack on the lower level for our bags and screens on the upper level so you could keep an eye on your bag, while enjoying the view. The ride was quite scenic. We passed some parks, a harbor, a massive ship yard, and crossed some nice bridges. The seats were nice cushy coach bus seats and I felt this was a real bargain and much more scenic than the train. Make sure you check the hours because these buses do not run at night. Hong Kong is warm and semi-tropical year round so pack appropriately. Check Holiday Weather or a similar website for the typical weather at the time of year you are visiting. You never know when there will be a sudden shower. I usually carry a couple ziploc bags since they are very small and light, just in case I need to protect my phone or other electronics. Footwear: Hong Kong is a big city with surprising amount of ups and down, but it is all paved. Your standard walking shoes will probably fine if you are traveling in the dry season and don’t plan on hiking. We only had room for one pair of shoes and planned on doing Suicide Cliff so we used hiking shoes for our everyday footwear. I had Salomon X Ultra Prime Cs Waterproof Hiking Shoes and my husband had Mizuno Wave Rider 21 GTX Running Shoes. We both really liked our shoes. My hiking shoes may have been a little bit overkill for walking around the city, but we didn’t have room for extra shoes and they were great for hiking. I tested my shoes out in the water and I could step in and fully submerge the laces without a drop of water getting inside. Rain Gear: Other than some ziploc bags, we both had a regular rain jacket. We had nothing but sunshine so we never had to use them. Depending on the season a packable one (like these woman’s/men’s) would be a good option. Language - Chinese and English are the official languages. Street signs and the metro will be in both, but Chinese is definitely more widely spoken and used. Many shops will only have Chinese signs and in many restaurants you will need to request an English menu. We encountered many people who did not speak English but got along just fine with gestures. According to our walking tour guide, schools are only required to teach a couple classes of basic English. Culture - Hong Kong has an interesting history as an English Territory that only rejoined China (mostly) in 1997. Wendover - How Hong Kong Changed Countries does a great job of explaining the transition of power. I say mostly because Hong Kong is a special economic zone with it’s own government, laws, economy, and currency, separate from China. It is an interesting mix of proud Chinese culture and a legacy of places named for British Royalty (ie. Victoria Peak). We were only in Hong Kong for a couple days, so this is just from my brief impression of the city and it’s people. I read that people were loud and rude as a part of the culture. We did not find that to be the case. On the contrary, we were amazed at how polite people were and how respectful of personal space. If you ever visit New York City you should expect to be bumped and jostled at crosswalks and especially on public transit and in other countries we have been packed into buses to the extent where we were in full bodily contact with people on all sides. 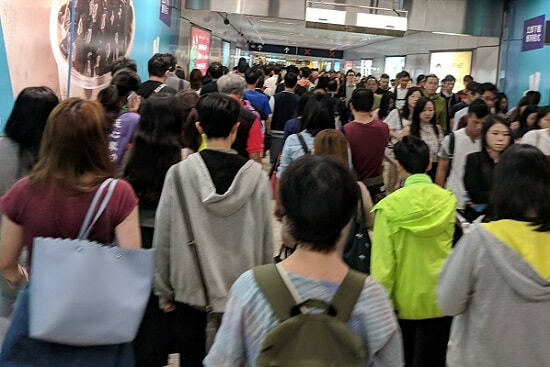 In Hong Kong we were amazed how well everyone navigated the public transit systems, moving quickly in one steady stream without touching. People stood in polite lines at the bus stops and while the trains could be crowded, everyone had their personal bubble and a word or touch on the shoulder was used to exit the train instead of elbowing through. We were also impressed by the apparent culture of exercise. We saw people of all ages doing Tai Chi, Yoga, and other forms of exercise all over the city. Religion - I was a bit perplexed when I was looking up temples and saw mention of icons from multiple religions being housed in the same temple. At first I thought this may be due to real estate being so expensive, but after some more research I came to understand that many religions are not religions in a strict sense, but more philosophies on how to live a good life. In that way you can pick the best principles of each and use them together to shape your life. Hong Kong Traveler talks a bit more about this concept and the most popular deities. We visited the Ten Thousand Buddha Monastery and the Man Mo Temple and would highly recommend both of them. Although they are not very popular in Hong Kong, at some point you may be confronted with the style of toilet that we affectionately refer to as a “squatty potty.” This is a toilet with water that is below the ground level and has grippy spots for your feet on either side. You put your feet on the foot spots and simply squat to do your business, which really isn’t too bad, but takes a little getting used to. In Malaysia I saw muddy foot prints on a European style toilet seat, where someone was apparently doing some risky acrobatics to use it in this way. Many public toilets can now be found by searching on Google Maps. Most major MTR stations (behind the gates) and shopping malls have public bathrooms. Make sure to get to a bathroom with time to spare, as they can often have long lines. Waiting for over 5 minutes is not unusual, at least for the ladies’ room. The wait at Victoria Peak was closer to 15 minutes. Visa - Most visitors don’t need them. Hong Kong is a special zone that is part of China, but is governed by different rules. While you need a visa to visit China, for most countries you only need a valid passport for short stays in Hong Kong, but make sure you check what the restrictions are. China Highlights has a detailed list with how long you may stay without a visa by country. Also be careful if you plan to visit Hong Kong as part of your trip to China, because single entry visas for China generally count going to Hong Kong as leaving the country. Immigrations - A small questionnaire was passed out on the flight and collected at immigrations. It asked pretty standard stuff like your home address, where, and for how long you will be staying. The immigrations process was pretty painless and they didn’t even ask any questions. Unfortunately, they don’t stamp passports, so if you covet those stamps you are out of luck. Good luck everyone and feel free to leave any questions (or share your own tips) in the comments below.